I let out a hearty laugh. In that instant, I saw myself through her eyes, and realized the power of Pavlov’s classic description of conditioned responses. If I didn’t want to condition my daughter to stay out of the kitchen, I’d have to change my ways. Similarly, in long-term relationships, try to catch your partner’s good deeds instead of simply noticing the irritations. In the case of Ken and Josie they were able to recall the qualities that attracted them to each other and made a point of expressing their positive feelings regularly. By expressing more appreciation they noticed they were complaining less. It feels good both to give and to receive heartfelt compliments. But they don’t have to be huge—even just a simple thank-you for doing the laundry counts. 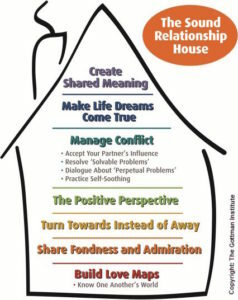 In fact, noticing and acknowledging those daily, routine things our partners do goes a long way to shoring up the foundation of our relationship house. Although it may feel awkward at first, positive interactions becomes automatic with attention and practice.